The teaser/trailer of Nandamuri Balakrishna’s forthcoming film Paisa Vasool in the direction of Puri Jagannath is released today i.e on July 28th. This is Balakrishna’s 101 st film and this is the first time that he has teamed up with Puri Jagannath. Bankrolled by V Anand Prasad, the shooting of the movie has been completed and the post-production activities are underway. Shriya Saran has been roped in as the leading lady opposite Balakrishna for the film which has music by Anup Ruebens. According to the makers, the teaser of this flick will be released exactly at 10:12 AM on 28th of this month on Youtube. This never expected amazing combo have gelled well with each other as both of them have been having a wonderful time in the sets. As the production of this movie has neared its end, the director wants to show a sample of this flick through the first teaser. Balakrishna will be seen as a mafia don in this flick. He will be romancing Shriya Saran, Kaira Dutt and newcomer Muskaan. Paisa Vasool has not confirmed its release date as yet. It is likely to release in the first week of September as the production work is already complete. Ardent fans of Balayya have been welcomed his teaser NBK seen in complete mass form. 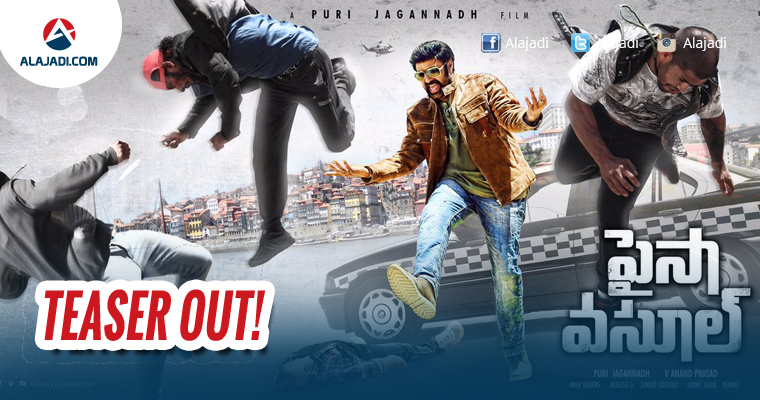 As of now, the released teaser and posters have impressed the Nandamuri fans in a big way. They are keeping much expectation on this flick. Produced under Bhavya Creations banner by V. Anand Prasad. Songs are composed by Anup Rubens. Balayya for the first time has sang a song in this movie.